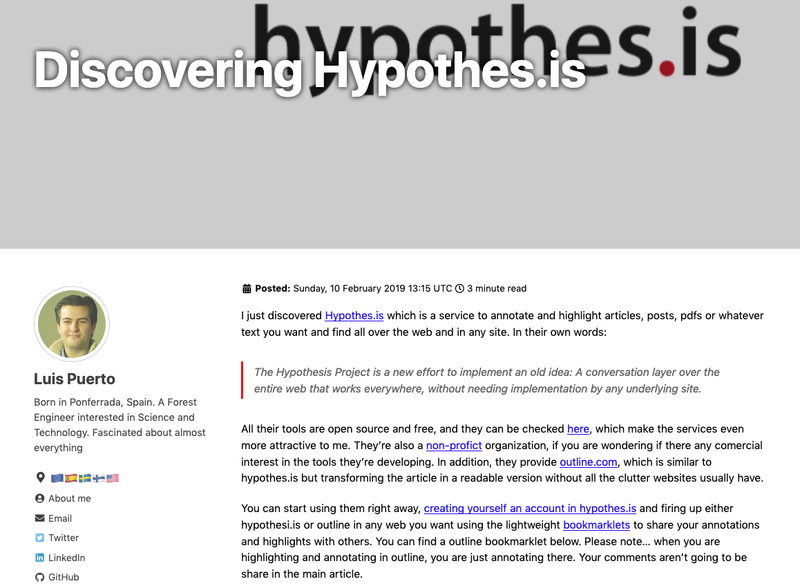 I just discovered Hypothesis which is a service to annotate and highlight articles, posts, pdfs or whatever text you want and find all over the web and in any site. All their tools are open source and free, and they can be checked here, which make the services even more attractive to me. They’re also a non-profit organization, if you are wondering if there any commercial interest in the tools they’re developing. 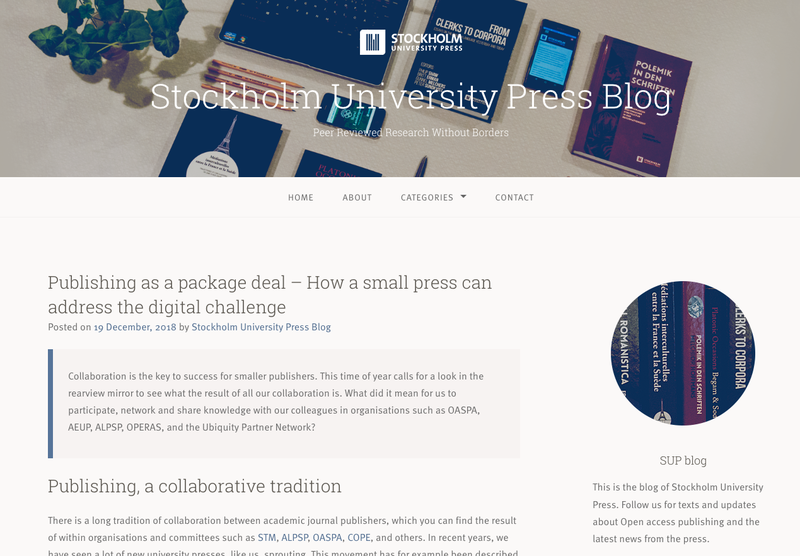 Collaboration is the key to success for smaller publishers. This time of year calls for a look in the rearview mirror to see what the result of all our collaboration is. 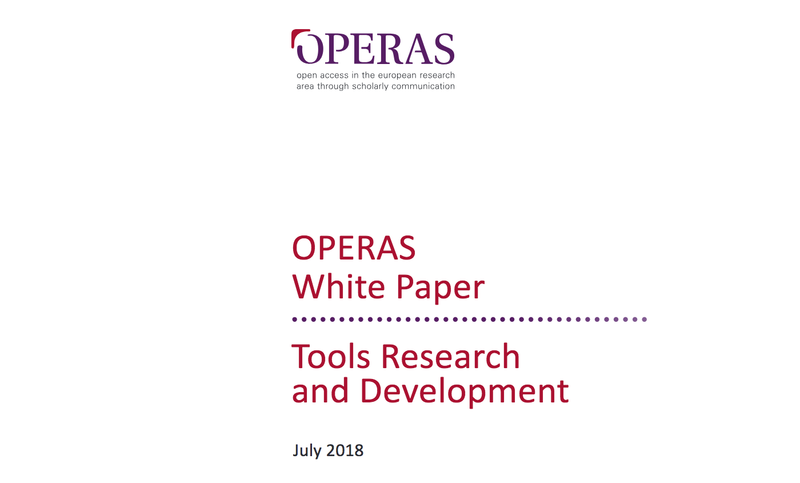 What did it mean for us to participate, network and share knowledge with our colleagues in organisations such as OASPA, AEUP, ALPSP, OPERAS, and the Ubiquity Partner Network? 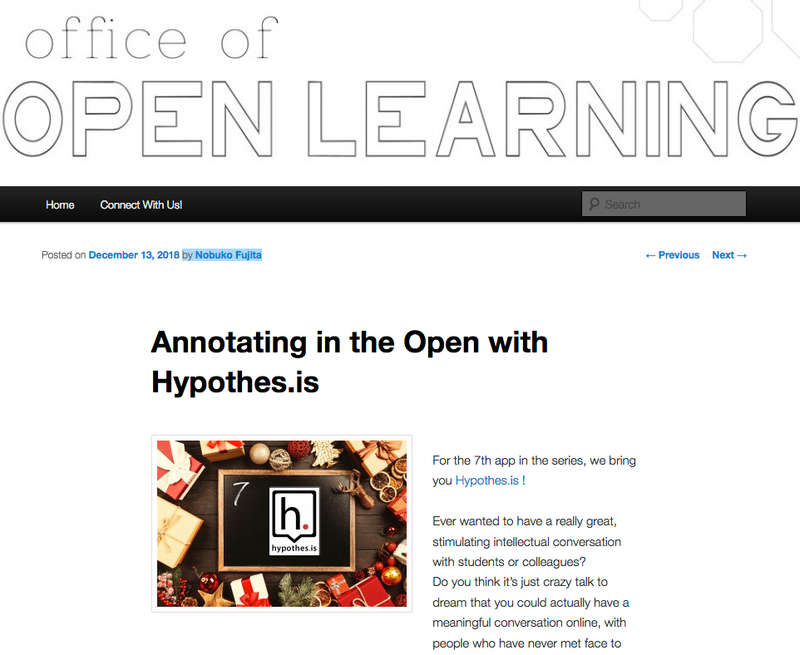 This year, we are also most pleased with developments that allow online annotation for all our books via Hypothes.is. This service allows all users to highlight and add notes while reading, and they can choose to make the comments public or private. It works for PDF files as well! This significant development has been possible for us due to the collaboration with Ubiquity Press and their engagement in the HIRMEOS project. So, the partnership works directly as well as indirectly. This year’s President’s Dream Colloquium on Making Public Knowledge at SFU was all about the public aspects of knowledge production and dissemination at universities. Fittingly, I found myself reading and creating public annotations on the readings for the course using a tool called Hypothesis. I would like to introduce the two big questions that I chose to investigate: What do annotations say about their creators? While the benefits of social reading for the student was fairly obvious to me, I wanted to explore what kind of story the data would tell about the student. 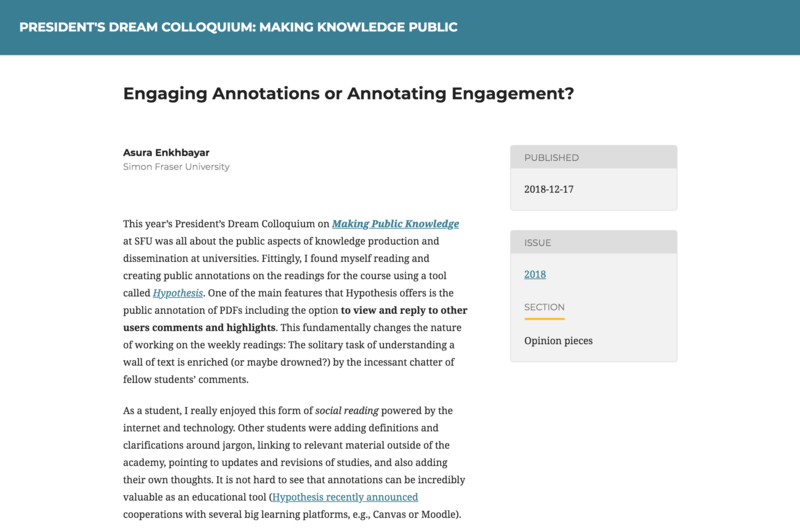 In an age of quantification and measurement, what does it mean to create public knowledge in the forms of online annotations? Can we use this data to evaluate students and their performance? Should we? What do annotations say about the original content? Academia is a world of competition. Publish or perish wonderfully summarises the environment that scientists and scholars are facing, as available job positions are scarce while their applications are assessed based on criteria such as publication volume or terrible indicators such as the h-index1 or Journal Impact Factor2 (JIF). Can we use annotation data to assess the articles? Does annotation behaviour reflect the engagement with the articles? 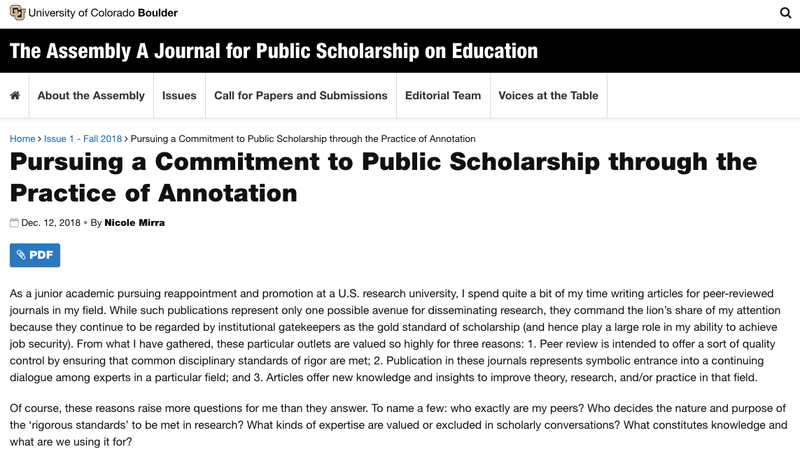 My experience with an openly networked public annotation initiative called Marginal Syllabus represented an opportunity to merge these approaches and offered innovative answers to my questions about constructing new peer communities and avenues for public dissemination of research. 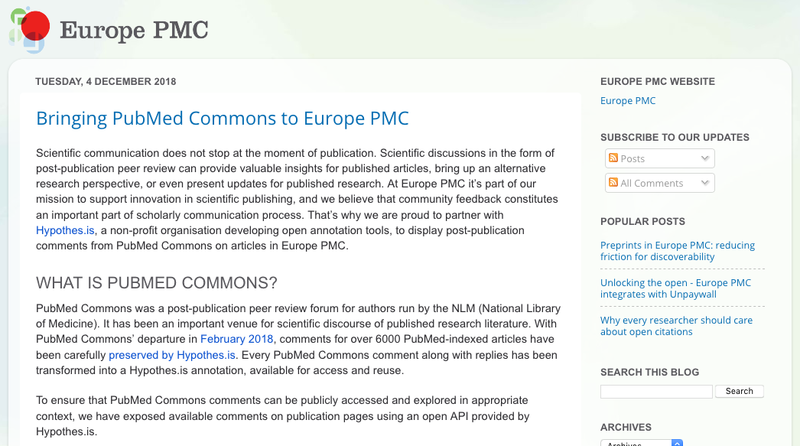 Through this initiative, in which one of my peer-reviewed journal articles was made available as a public text that could be commented upon, I was given the opportunity to imagine a different paradigm for conducting, consuming, and responding to research - one in which study findings become the start rather than the end of dialogue and in which diverse forms of expertise extend, refute, and re-mix the knowledge production process for the common purpose of making education more equitable and culturally sustaining. I share my experience with the hope of provoking further conversation about what it means to take democratic values seriously in academic research. Ever wanted to have a really great, stimulating intellectual conversation with students or colleagues? Do you think it’s just crazy talk to dream that you could actually have a meaningful conversation online, with people who have never met face to face before? Read on. We are happy to announce that we have released a technical change that allows readers to annotate e-books within the browser. Books at Ubiquity Press, and on the wider Ubiquity Partner Network, are often available in EPUB format. We use a great open source package created and maintained by Fred Chasen from FuturePress.org which allows site visitors to read the books in any browser. This means that there are no files to download and no additional software/hardware required to read the EPUB content. 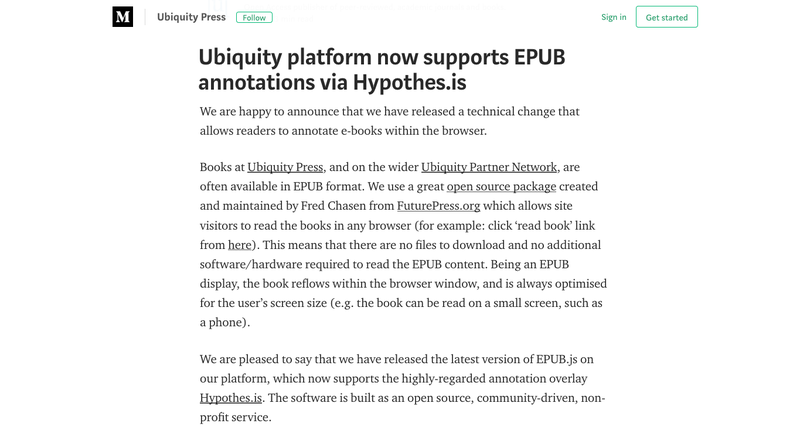 We are pleased to say that we have released the latest version of EPUB.js on our platform, which now supports the highly-regarded annotation overlay Hypothesis. The software is built as an open source, community-driven, non-profit service. Hypothesis is a free service to users and allows annotations, highlights, and page notes to be made publicly, privately to oneself, or to a private group (ideal for a class discussion). 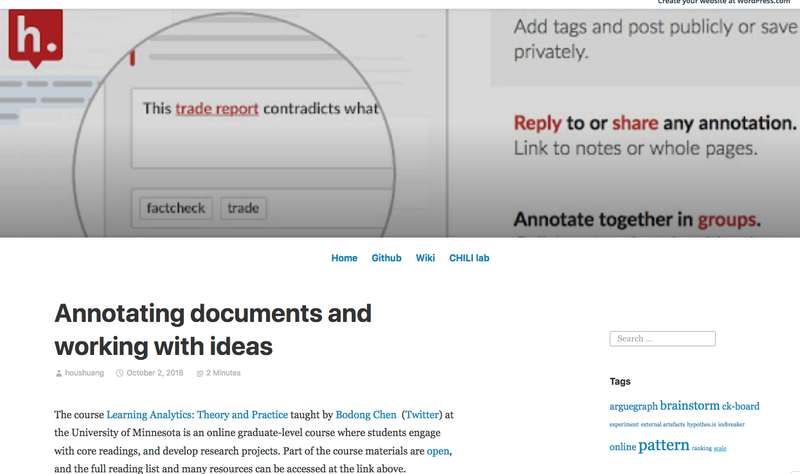 A description of a sophisticated learning exercise at the University of Minnesota enabled by custom software applications that enable students to work together to bring multiple artifacts, including Hypothesis annotations, together into a collaboratively authored document. Working in open-access institutions with a large majority of underserved populations, community college instructors often face the twofold tasks of helping students become conversant in discipline-specific coursework and also bringing students up-to-speed in their academic skill sets. Between publishers' higher costs of textbooks and students' struggle with large amounts of reading materials, getting students to both access and engage more deeply with texts is a challenge. 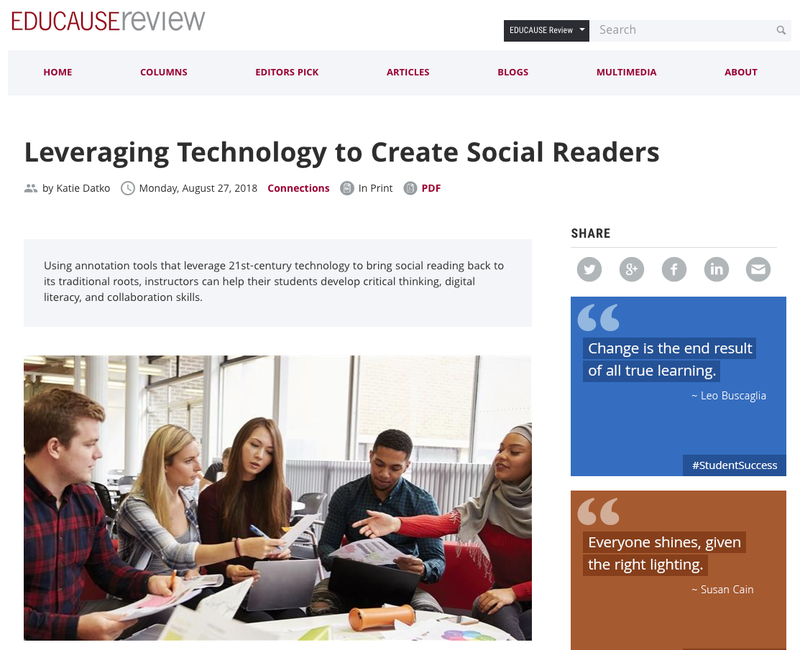 Using annotation tools that leverage 21st-century technology to bring social reading back to its traditional roots, instructors can help their students develop critical thinking, digital literacy, and collaboration skills.